As you may have read, we’re huge fans of the Canon Professional Services program for several reasons, which is why we renew our membership every year. Having just received our 2013 Gold Membership packet, its a great reminder of why the program is worth it. The two clean and check coupons you received pay for the membership alone. 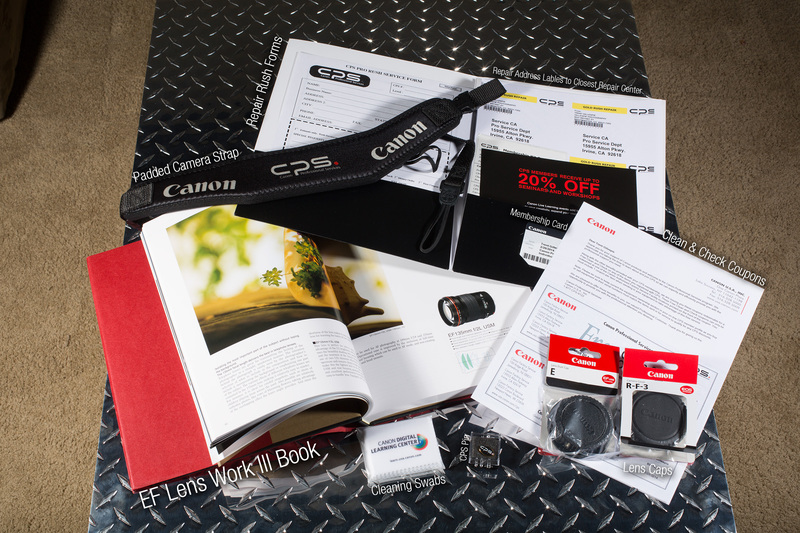 An added bonus is the EF Lens Work book, which they continually update and send out upon renewal. The book is an excellent resource to lend to fellow photographers wanting to learn more about Canon gear or photography in general. The III version of it includes the newly refreshed 2.8 super-telephotos, but does not have the 24-70 f/2.8 Mark II or the 24-70 f/4. I just so happened to be in the middle of a product shot when the new CPS packet arrived, so I snapped a quick picture of it. If you have any questions about the contents, or the program in general, please let us know.